We invite you to review the Rutgers School of Nursing–Camden inaugural strategic plan and look forward to any comments, questions, or suggestions you may have. Social justice is the fundamental, unifying theme informing our school's strategic direction. We believe a person's zip code should not determine the quality of their health care. But the truth is, neighborhoods and built environments do in fact make an enormous impact on access to care, good health, and well-being. Research indicates that the burden of illness is greater among minorities and low-income communities that have limited resources. In a free society, access to care—and decision-making regarding one’s care—are basic rights, not privileges. Nurses, as professional leaders and advocates, have the individual and disciplinary responsibility to increase access to adequate care across the continuum of health promotion, disease prevention, sickness, recovery, rehabilitation, and end of life, especially for underserved populations. Each individual, regardless of economic or social status, has dignity and worth. Each must be recognized as an active participant in his or her health care decisions. Our core values arise from our school's Philosophy of Nursing, Teaching, and Learning, and include: social justice, respect, rigor, and resilience. We educate clinically excellent nurses who become strong, interprofessional team members; visionary advocates and leaders; and engaged citizens who build healthy communities in southern New Jersey and beyond. Rutgers School of Nursing–Camden's vision is to be known for excellence in nursing education, advancements in nursing science, and a vibrant, innovative, and trusting milieu. A new Nursing and Science building located within an evolving urban academic health science campus. 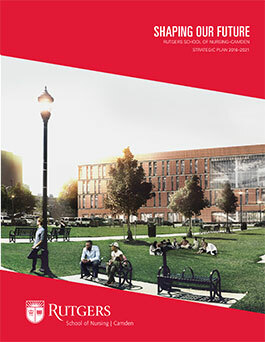 The school's strategic planning process used the Rutgers University–Camden strategic plan, Shaping our Future: Strategic Directions for the Campus, 2014-2019 as its impetus and framed its approach with the core values of Rutgers University–Camden: prestige, access, innovation and impact.